Registrations for the Inaugural International Outdoor Recreation Camp is now open! The camp will be held on Monday 23rd September 2019 – Friday 27th September 2019 at the Calvert Trust Lakes District, in England. The camp will include 4 nights and 3 full days of activities and include a mix of individual, group and social activities. The emphasis will be on team activities, making new friends, building self-confidence, challenging what you think is possible and breaking boundaries through outdoor adventure. 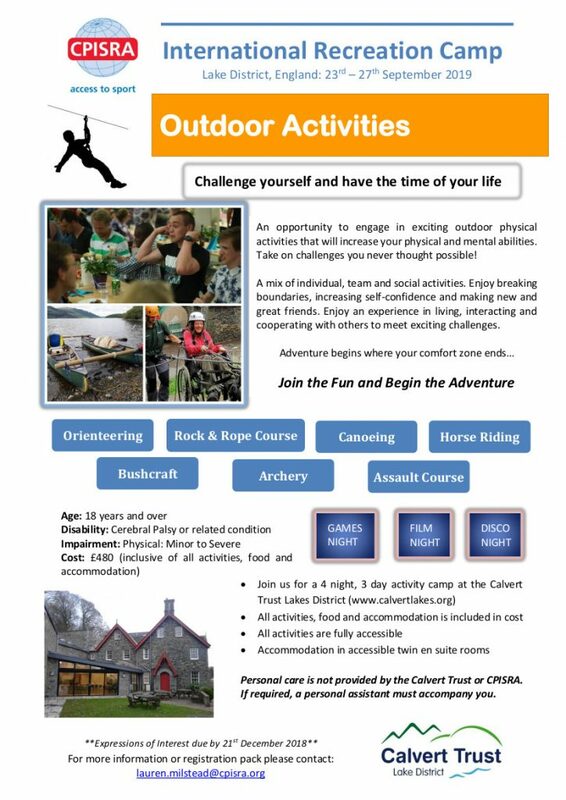 This inaugural camp is for adults (18+) with cerebral palsy and related conditions and you will be challenged to activities such as rock climbing, orienteering, canoeing, an assault course and much more. All activities and accommodation are fully accessible. Please contact lauren.milstead@cpisra.org for more information and to register your interest.